I am sure this has been addressed more than once and for that I am very sorry. I currently have a Manchurian 26mm maple burl shaving set on order from Elite Razor. What synthetic brushes do you recommend as an alternative? I would use it exclusively for face lathering with creams and soaps. I am well pleased with my Razorock Plissoft. Very reasonably priced too. If you don't mind spending the money the Simpsons synthetics perform nicely also, I used mine for my most recent shave. RazoRock Beehive ... it is AWESOME !!! All of the responses so far have been for Plisson-type brushes. However, if you want backbone — not identical to, but similar to — the backbone of your 26 mm badger, a Mühle or Edwin Jagger STF style of knot may suit you better. thanks everyone. no opinions on wolf whiskers? Wolf Whiskers use the black wolf hairs, which I consider to be the top of the synthetic knots. Check out Nathan Clark 8 Ball brush, it has the same hair. I tried a few, and finally settled on a Simpsons chubby 2 synth. It features the level of backbone I’ve come to expect, even if the splay takes more work than I’d like. It’s pretty superb using paintbrush motions. (11-14-2017, 05:49 PM)mike_the_kraken Wrote: I tried a few, and finally settled on a Simpsons chubby 2 synth. It features the level of backbone I’ve come to expect, even if the splay takes more work than I’d like. It’s pretty superb using paintbrush motions. Yes, paintbrush strokes. Once you learn it’s idiosyncracies it’s a top notch brush. Muehle makes in my opinion the best synthetics. My Whipped Dog 30mm synthetic is my favorite shaving brush. I like everything about it, flow through, back bone, splay, and the super soft tips. I echo what the lads above said about Simpson synths. Great for paintbrush strokes. I have a Chubby 2 and a Duke 3 and I enjoy them. They really are different from the 10-12 other synths I have. The only negative I experience with them is that if I splay the knot to "create" lather it forces the lather back onto the handle. I've never had a synth do that before. I also have a Cashmere that I like; it reminds me of a well broken in Zenith or Mondial boar (though not identical, of course). I have a couple Razorocks, the 24mm Plissoft and the black Plissoft in the 400 style handle. Great value. I also own a couple Zenith synths, and like them. But be sure to check the size of the glue bump- some have glue bumps so high the brush won't splay so its as artificial in feel as an Omega Hi-Brush, while others with a lower bump are as good as the Muhle or Jaggers that get such good reviews. For the past 3 months or so I have been using an Omega silver beehive S- Brush. I’ve had it for over a year but just started to give it a real try. Now the bristles do look cheap as all get out but this is a serious performer. It makes great lather with every soap I’ve tried it on so far and holds plenty of lather too. It is not as soft as the Plisson types but I normally use boars so this is a great alternative. Also it cleans up way more quick and thoroughly than any of my naturals. Can’t remember exactly but I think I bought it for around ten bucks. IMO it is a very capable synthetic. My favorite synthetic is the Stirling Kong. I have a 24mm tuxedo knot brush and have tried a chubby 2 synth. I also have a maggard 24mm plissoft and a stirling 26mm plissoft(non kong). There is just something about the Kong that makes it feel right on face lathering. I have tremendous synthetics from Whipped Dog, Plisson, Yaqi, APShaveCo and Omega. The modern synthetic knots (including the tuxedo and cashmere) are incredibly “efficient” in their lathering ability. I enjoy my Simpson, Brad Sears and Paladin badgers, and my boars and horses, but nothing whips up, and releases, lather as easily as the modern synths. 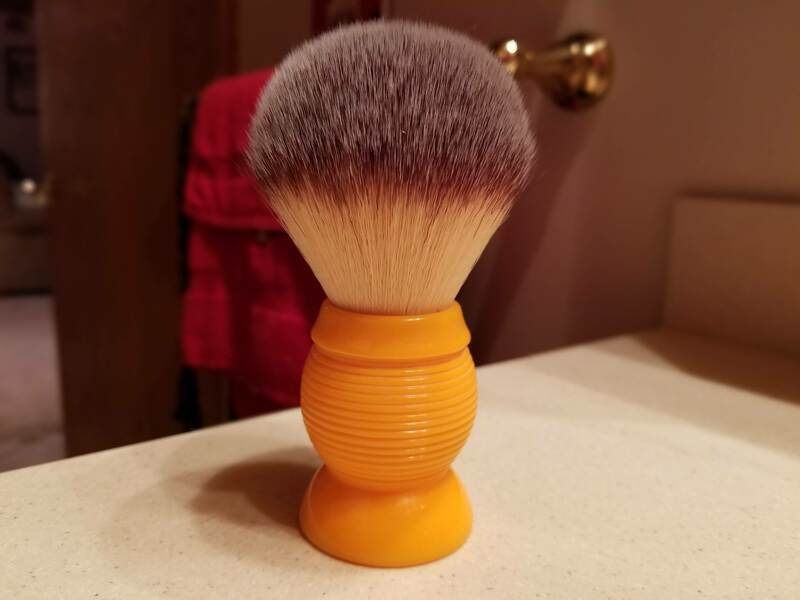 If you're looking for one of the inexpensive brushes with Plisson type knots, the Maggard Razors Granite is a good option. The quality of the handle is beyond what one expects at such a low price point. Maggard is hard to beat, IMO. I have two, and they are lovely to look at and use.